The research, published in Immunity, shows that mice fed on a diet rich in indole-3-carbinol—which is produced when we digest vegetables from the Brassica genus—were protected from gut inflammation and colon cancer. "We studied genetically modified mice that cannot produce or activate AhR in their guts, and found that they readily developed gut inflammation which progressed to colon cancer," explains first author Dr. Amina Metidji from the Francis Crick Institute. "However, when we fed them a diet enriched with I3C, they did not develop inflammation or cancer. Interestingly, when mice whose cancer was already developing were switched to the I3C-enriched diet, they ended up with significantly fewer tumours which were also more benign." By studying both mice and mouse gut organoids - 'mini guts' made from stem cells—the researchers found that AhR is vital for repairing damaged epithelial cells. Without AhR, intestinal stem cells fail to differentiate into specialised epithelial cells that absorb nutrients or generate protective mucus. Instead, they divide uncontrollably which can ultimately lead to colon cancer. "Seeing the profound effect of diet on gut inflammation and colon cancer was very striking," says senior author Dr. Gitta Stockinger, Group Leader at the Francis Crick Institute. "We often think of colon cancer as a disease promoted by a Western diet rich in fat and poor in vegetable content, and our results suggest a mechanism behind this observation. Many vegetables produce chemicals that keep AhR stimulated in the gut. We found that AhR-promoting chemicals in the diet can correct defects caused by insufficient AhR stimulation. This can restore epithelial cell differentiation, offering resistance to intestinal infections and preventing colon cancer. 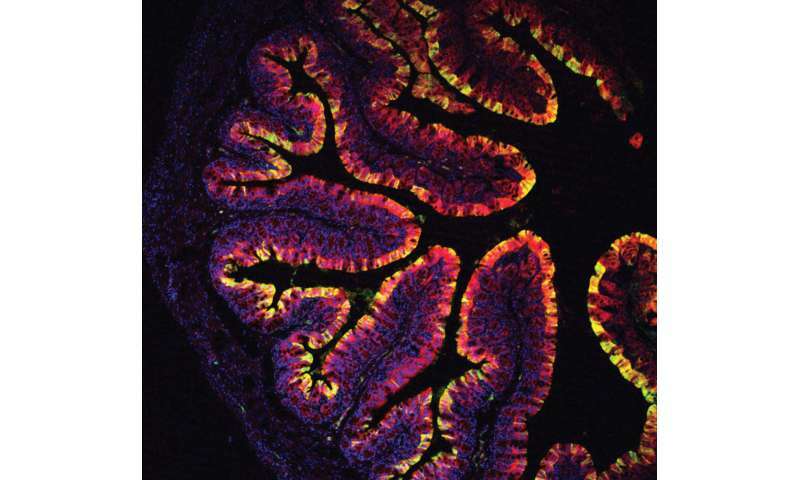 "Normal mice on the purified control diet developed colon tumours within 10 weeks, whereas mice on the standard chow didn't develop any," explains co-corresponding author Dr. Chris Schiering, who worked on the study at the Crick and now works at Imperial College London. "This suggests that even without genetic risk factors, a diet devoid of vegetable matter can lead to colon cancer." The vegetables maybe good but what about all the residual pesticides also found in vegetables. Do they negate the benefits?